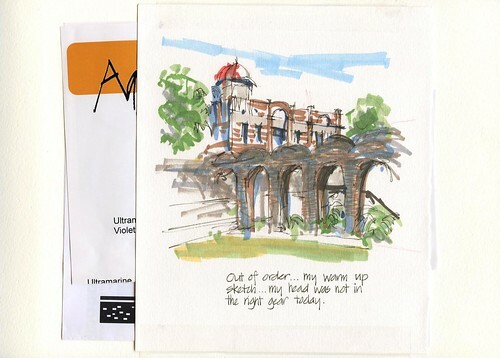 Urban Sketchers Australia: Wrap up of our USKSYD event! 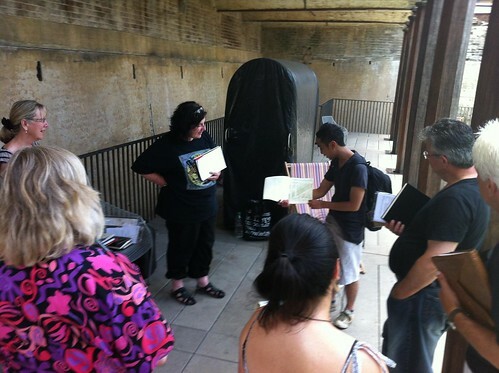 The first meeting of Urban Sketchers Sydney at Paddington Reservoir gardens... what a great location and a great day!!! 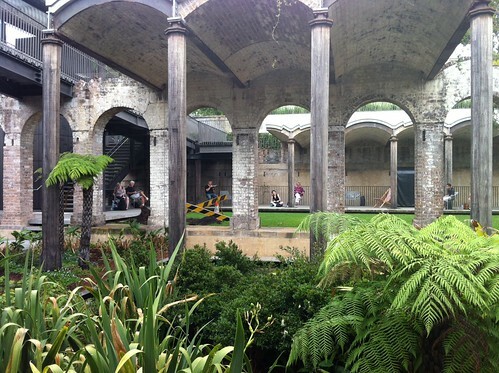 This is one of coolest new urban garden in Sydney - the site of an old water reservoir and a wonderful oasis in a very busy part of the city. It was a very warm day (forecast of 36C and just had a few showers) but it turned out to be ok as plenty of shade and shelter and the morning cloud cover kept the temperature down... I commented that it was more pleasant than Santo Domingo. I had prepared a little handout with some 'stuff' about Urban Sketchers - the manifesto, where we share online etc AND also a colour page introducing 3 USKers from Barcelona- 3 great friends and inspiring artists - Lapin, Freekhand (Miguel Herranz) and Swasky. Each month I plan to introduce some different sketchers from the global community- we do have the tendency to feel so far apart from the rest of the world all the way down here, so I hope this will help to make us feel more connected - I know that Lapin, Miguel and Swasky felt like they were virtually there as well. 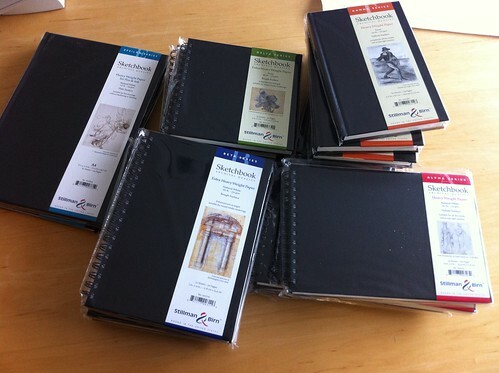 I also had a pile of Stillman and Birn books to hand out - a special thanks to S&amp;B and the new Australian distributors S&amp;S for sponsoring our first event... you can't imagine how excited I was to be able to be 'santa claus' and to share these wonderful sketchbooks with my friends!!! Huge thanks to Michael from Stillman and Birn and Simon from S&amp;S the new distributors for this amazing sponsorship !!! thanks!!! So... after all that it is not surprising that I was quite in the mood for sketching... so I got my markers out. Did it on a separate piece of paper and then stuck it in my sketchbook - provided a pocket for my handout and also the description of the gift I received. 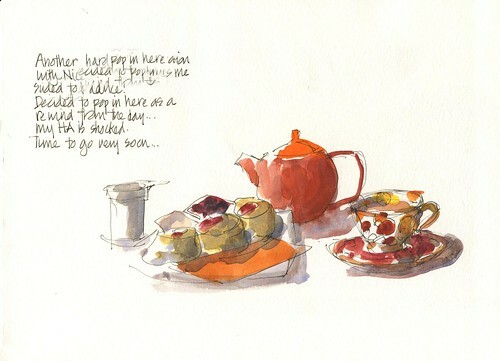 I went out to the corner to sketch, but as these events are as much about the social aspect as the sketching, was a wee bit distracted by some lovely conversations. We were very honoured to have three great watercolour artists with us on Saturday - John Haycraft, Rob Candy and Malcolm Carver. Malcolm gave me a gift of his special palette... I will do a separate post about this because it is very very interesting and an exciting concept. I worked big and loose and only managed to splash on a little bit of paint when I thought it was time to move ... I added a little paint to this back at home. We were very privileged to have an international visitor at our gathering as well - Sarah from England has been travelling around Australia and noticed via the blog that there was an event on in Sydney and she was able to come. SO I then went up to sit next to her...and attempt a chat and sketch at the same time sketch... added a little more watercolour pencil for the texture of the brick walls back at home. A huge thanks for everyone that turned up and were so keen to sketch and share! Can't wait for next month - keep Sat 12 Jan free!